Ted Neifeh’s Princess Ugg has been a delightful twist on the typical princess narrative, building a metaphor for the teenage girl experience through the trials and tribulations of a Viking princess who is enrolled in a school to teach her to be a proper lady. Ülga was initially met with scorn and ridicule from her prissy princess classmates, but over the course of the series, those bullies have learned to appreciate Ülga’s capabilities, particularly her skill in battle. 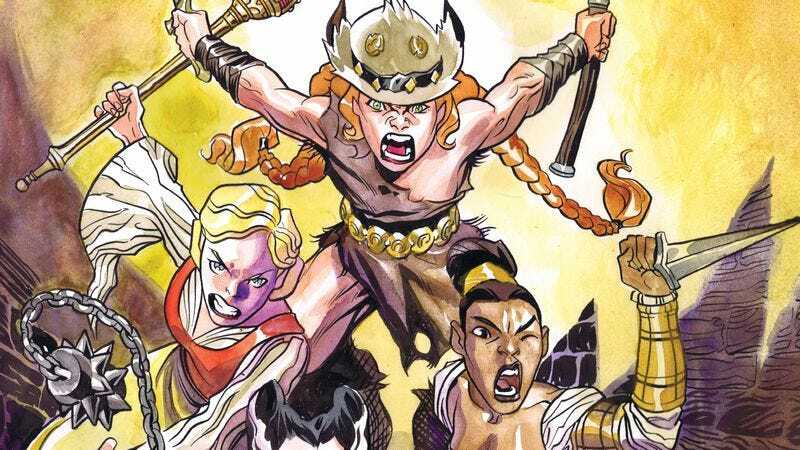 In this preview of next week’s Princess Ugg, the other girls take a page from Ülga’s book to save themselves from a misogynistic captor by unleashing the barbarian within, revealing just how strong Ülga’s influence has become on her new friends. This preview spotlights the vivid expression, forceful action, and distinctive character design that has made Princess Ugg a visually captivating title, and Neifeh’s art is given extra dimension by Warren Wucinich’s rich color palette. The cover art is a perfect distillation of this book’s unconventional take on princesses, showing Ülga and her classmates rushing forward in a fury with weapons in hand, and that contrast of traditional masculine and feminine elements propels the story forward. Each issue of Princess Ugg has added depth to the narrative and revealed new sides of the characters, and with Ülga’s comrades fully embracing her aggressive spirit, she’s positioned herself as a teacher who shows the other princesses how to fend for themselves.